Game changer. It's a term that's tossed about these days. But do you know what it means? By definition, a game changer is someone who is a visionary. 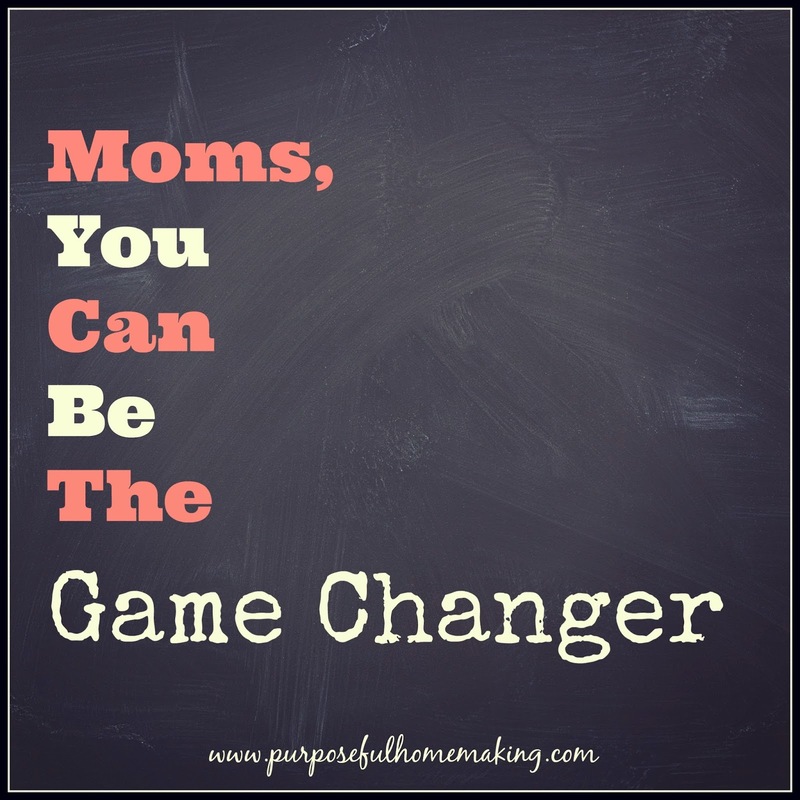 In a world where motherhood, to some, seems like "not the best use of your time" you can be the game changer. When I was about 17, I told the Lord that I was willing to be used in full-time Christian service. To be honest, it was a commitment made half-fearfully. Okay, maybe entirely with fear, but I knew that I wanted to live my days in service to God. At the time, I assumed it meant that I was signing myself up for overseas mission work or something. About a year later I began pursuing a teaching degree and sensed the Lord wanted me to teach in a Christian school. At that point in my life, I had never been on a missions trip out of the country. I had, however, served for a couple of weeks each summer through college at a small mission-supported church in the Upper Peninsula of Michigan. To be honest, the area was so foreign to me it almost seemed like a missions trip outside of my home country. At one point I thought maybe God was leading me to teach in a small Christian school in the area, but, considering I was single, and had no income and there was no pay it didn't seem like that situation would work out. I continued pursuing my degree in education, all the while wondering where I was going to end up. In fact, one summer I was home from college and went to the local gas station to fill up my car. I was so caught up in wondering if I was going to move back to my hometown or if God had another place for me to serve that I was awakened from my daydream by a guy yelling at me that my gas tank was overflowing! Lovely. The automatic shutoff on the gas pump was broken and I was in La-La Land so some of my hard-earned cash just went towards paying for gas that I had spilled all over the ground. But, back to reality, I kept pursuing missions to see if that is what God had for me. My first year out of college, I began working at our church to help get a Christian school started. I was planning to teach the following year when it opened, but during that winter I went for a couple of weeks to help our church's missionaries in Brazil. I was presented with the opportunity to homeschool the missionary couple's daughter who was in 6th grade. The task seemed daunting since I didn't feel qualified to teach the upper grades and I would have to back out of my commitment to teach at the school that fall. I declined the offer and continued to get ready for teaching my 1st class that coming fall. A short time later, I had the opportunity to serve in Serbia for two weeks. Through these short term missions trips, I learned a lot and became grateful for things like hot showers, which were a luxury on at least one of those trips. I also personally saw unreached people groups in Brazil that lived in nothing more than shanty towns. My heart ached for those people and I came back from that trip thinking that God really was calling me to serve Him full time by ministering to people who had never heard the Gospel before. Little did I know that what He was actually calling me to was Motherhood. So sure enough, He did have an unreached people group that He wanted me to love, care for, minister to, and share His love with. In all my daydreaming,and gas station mishaps, which I have more of, believe it or not, did I EVER picture myself married and a mother. It just never crossed my mind. At that point, I always pictured myself single and serving somewhere other than my hometown. But God had this incredible, awesome plan for me that I am over-the-top about. It is, by far, the hardest role I have ever filled and something I still don't feel adequate for. I usually think I have to be strong and brave like, well, my Mom of course. I have a sneaking suspicion that my daughter views me as strong and brave. I know I am not, but the strength of God more than makes up for my weaknesses (and they are many). In all those years of searching and wondering, the desire of my heart was always to be in my hometown near my family, but I knew I needed to be open to serving God wherever He called me to. When I stop and think about how He gave me my heart's desire and He had this plan for my life that I never even dreamed about, I can't help but cry out in thanks to my loving Lord. I could not fulfill this role of mission work without Him. In the midst of changing diapers, He has called me to help change hearts. And that can only happen when His grace is poured out on a little soul through countless days of lavishing the Word upon them. Regrettably, when I think about how little I have exposed them to His Word compared to what I could have done, I feel that I have fallen incredibly short of my mission. But God's mercies are new every morning and His faithfulness towards us is great. As I stamp His image deep on my heart, I help stamp the image of Christ on the life of each little one that He has placed in our home. And oh, how blessed I am to be their mother. I am desperate for God's grace in my mission work of motherhood. And while the days seem long at times, the years are flying by. I know my time is short and I want to pour my life into these precious children. It is with wonder and amazement that while I assumed serving God full-time meant ministering on the foreign field, He would instead call me to motherhood. Moms, we cannot do this alone. The calling is far too great, the demands are unending, the sleep is short and there are souls in our care that are in danger of living independently of God. We have children that are drawing their strength and character from us. This demands that we saturate ourselves with the Word of God. When God's Word is hidden in our hearts, it comes out in our speech and in our actions and then, Christ is glorified in the ministry of motherhood. Joshua 1:8-9 "Study this Book of the Law continually. Mediate on it day and night so you may be sure to obey all that is written in it. Only then will you succeed. I command you--be strong and courageous! Do not be afraid or discouraged. For the Lord your God is with you wherever you go." Mom's are you a visionary when it comes to your children and husband? Or have you fallen into the trap of living the status quo in your role as wife and mom? Don't despair! God's mercies are new each morning and you can surrender your life to God starting right now. You can be the game changer in your family's life and in the world you live in.